BOCA RATON – Debbie Schmookler reacted to the unsolved murders of Nancy and Joey Bochicchio. Her family from Brooklyn New York is on vacation in Palm Beach County. Monday, they went to the same mall where the bodies of the mother and daughter were found. But Schmookler feels Boca’s Town Center is safe. “I think it was a fluke, it had nothing do with the mall,” she added. It was in the mall’s parking lot, however, were the Bochicchio’s were found savagely murdered in their SUV back in December of 2007. Mom and daughter were bound and shot in the head. They were found wearing swimming goggles which the public hadn’t seen until now. “We don’t usually release evidence of this sort,” said Boca Raton Police Officer Sandra Boonenberg. That’s because, unlike other pieces of evidence, investigators have no idea who manufactured the goggles or where they were sold. The blacked-out goggles were used to cover their eyes. They have a yellow plastic frame with a hinged bridge across the nose and vents on either side. The lenses are removable. The black headband is elastic. “What we are looking for is anyone who may recognize them. The origin or point of sale of these particular goggles,” she said. Detectives say they have already checked out 95% of the tips they’ve gotten but would not say if they are any closer in finding the person responsible. Clearly, no lead has turned into anything substantial in over two years. For the visiting Schmooklers that’s not surprising. “After watching CSI, people expect everything to be solved instantly. It doesn’t always happen that way,” said Beril Schmookler. 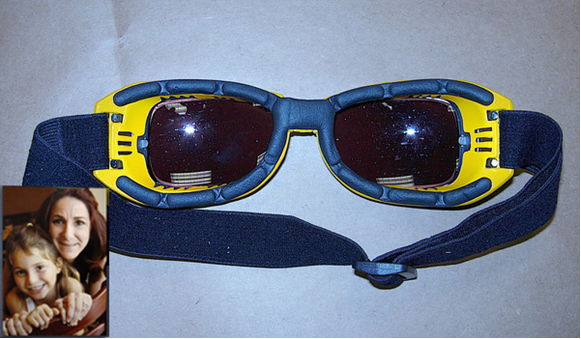 Anyone with any knowledge of the manufacturer, points of sale, or make of these goggles or any other information is asked to call Detective Jeff Clare at 561-338-1246 or if you’d like to remain anonymous and be eligible for up to $1,000 REWARD call Crime Stoppers at 800-458-TIPS.